Deodorize Musty Books. If you’ve kept old books in boxes, or if they’ve been sitting on the shelf for a little too long, use newspapers to get rid of the musty smell. Before you crack open the spine, put crumpled newspaper in the bottom of a paper bag, put the book inside, and then add crumpled paper loosely all around it. Let it sit for at least a week, and then open the bag. The newspaper will have absorbed the musty smell! DIY Newspaper Roses. It may not smell as sweet as a real rose, but it will definitely last longer! Make this easy-to-DIY playful take on a classic rose. All you need is paper, gauge wire, a glue gun, scissors and wire cutter! Cut out your petals to their desired size and then glue them into place. For step-by-step instructions, visit: 100 Layer Cake. Once the glue has fully dried, feel free to paint your roses! 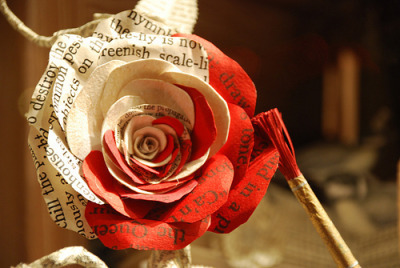 If you’d rather buy than DIY, visit Etsy for loose paper roses. Make Animal Bedding. Instead of purchasing expensive over the counter animal bedding for your hamsters, guinea pigs, rabbits or mice, cut up newspaper. It’s safe and non-toxic, plus it’s inexpensive. Wood shavings can cause respiratory problems and can also harbor allergens. Instead, place newspaper in your cage or crate (you can pass the paper through a shredder or cut it into small strips first if you'd like). To keep your pet safe and clean, change your paper bedding regularly. Ripen Green Tomatoes. If you have green tomatoes left on your vine, don’t waste them! Instead, use newspaper to ripen them and get them ready for your summer salads. Pick the green tomatoes, and then wrap them individually in newspaper. Layer the tomatoes in a box no more than two layers deep. Keep the box in a dark, dry area (like a garage or pantry) and check it weekly for progress. It typically takes 3-4 weeks for the green tomatoes to ripen. When you check the tomatoes, be sure to remove any that are rotting instead of ripening.